I received Mad City as my September Amazon First book and decided to upgrade it to the audiobook version because I usually prefer listening to nonfiction books. I was intrigued by the prospect of learning about a forgotten homicide; however, I quickly found myself disappointed in the story’s progression and actually relieved when I finally reached the end. As you may guess, this will not be a glowing review of Mad City, which I rated 2 out of 5 stars. Mad City, per the synopsis, promises a discussion of the murder of Christine Rothschild in 1968 at the University of Wisconsin. Sure, we learn about this murder, take a detailed look at the killer, and follow Christine’s best friend, Linda, on her personal witch hunt for justice. We also learn about seven other murders (I think it was seven) of females loosely associated with the University of Wisconsin that occur over a span of 15 years after Christine’s death. Additionally, readers are treated to an intense discussion of criminal profiling, criminal mentality, the differences between criminal modus operandi, MO, and signature, as well as, a detailed discussion of every major serial homicide case in America between 1968 and 2013. It was just too much. I want to get my positive points out now. The prose was well constructed. Additionally, Arntfield is obviously knowledgeable about criminology. His discussion of the criminal mind and detailing of a variety of cases is well researched and comprehensively presented. 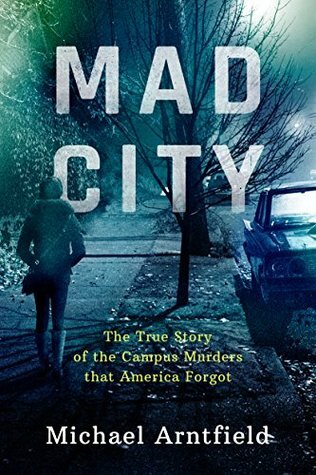 Honestly, I would consider Mad City a decent novel if it had been marketed as a nonfiction piece evaluating criminal mentality in serial murderers. These two points are the only reason I didn’t stamp Mad City with just 1 out of 5 stars. Mad City starts strong with the details of the Christine Rothschild case, but then quickly disintegrates into chapters upon chapters of information overload. Readers are forced to sift through the information in an attempt to distinguish the forgotten campus murders between descriptions of other murder scenes, other killers, and other cities plagued with serial murder activity. Unsurprisingly, this information overload completely negates the purpose of Mad City, and leaves these UW campus murders all but forgotten in this criminology text. Additionally, Arntfield pulls this nonfiction into the realm of fiction, when he consistently provides the thoughts and motivations of every investigator associated with the UW campus murders over the course of 15-20 years. What follows is blatant cop-bashing as Arntfield pretty much claims that these investigators intentionally ignored these cases, attempted to ‘pin the crimes’ on individuals just to get them off their desk, and refused to connect the murders out of sheer laziness. Arntfield does give some nod to the lack of modern investigation techniques hampering progress, but his credibility is completely ruined by his blatant padding with pure conjecture. It is cop-bashing by a former cop and has no place in a work of nonfiction. Spoilers: there are a number of times when the author breaks the fourth wall and provides his personal opinion on events. This type of writing is fine in certain types of nonfiction works (memoirs, self-help books, travel stories, etc.). It is not appropriate in a historical true crime novel, unless the author has a personal role in the story. I spent the whole story annoyed with this audacious style UNTIL it is revealed the author does have a personal role in the story IN THE LAST CHAPTER. UGH! This should have been announced in the epilogue or first chapter, and would have justified the language of the novel. Sadly, I do not think Mad City succeeded in informing readers on the campus murders that America forgot. The overload of crime information only managed to further muddle the University of Wisconsin murders. I was disappointed, but I do feel that Arntfield has potential if he can make his work on criminology strictly objective. Do you have any true crime nonfiction that you suggest? I need to read something good!